From Kiyomizu-dera we walked down, back to the city across the Gion district. 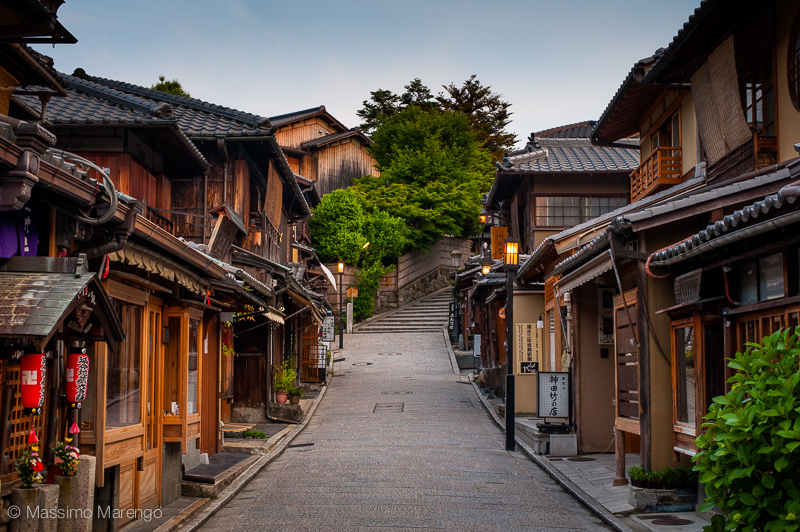 Gion has preserved the traditional architecture of wooden machiya houses, now mostly converted into restaurants serving traditional Kyoto-style meals (kaiseki ryori) and tea-houses (ochaya). It is also the most famous geisha districts, that performs in the most expensive and exclusive establishments (rarely for tourists, as you need to be introduced by an existing customer). Still, it is not uncommon to cross path with a geiko (Kyoto dialect for geisha) and maiko (geiko apprentice) as they walk to and from work dressed in beautiful kimonos. The plan for Mayli and me was to find a place to eat. The problem with this is that we could not agree on where to stay, and I started to feel more and more uncomfortable about the price of the menus affixed to the restaurants (these were the cheap ones, the higher end establishments didn't even post prices). Now, I am not necessarily against spending significant money for food, when the experience is worth it. It was however not the right day, as I was starting to feel more and more sick due to a strong cold (a flu?) that started to catch up with me as soon as we left the ryokan in Hakone. I was tired, I was sick, I was grumpy. Grumpy enough that I managed to really upset Mayli as she was desperately trying to find a place I would agree to eat in. In the end it was too much even for her patience, and we got back to the hotel as soon as we found a bus going the right way, without dinner (in the end we managed to eat something near the hotel). My state of (not)health wasn't very promising for the few days left in our vacation, so Mayli the next day persuaded me to go to a pharmacy and find something to relieve my congestion. Now, try to find the right medication in a country were your usual medicine have a different name, and all labels are written with an alien alphabet. Well, we have been studying the basic kanas (the japanese syllabic alphabets) for quite some time before the trip, so as soon as we found a pharmacy we started the laborious work of translating, letter by letter, anything that was looking like a cold remedy. After a good part of an unsuccessful hour, we decided to ask the pharmacist, that of course didn't speak english. As soon as she saw my face, however, she figured out my problem and exclaimed: ルルアタック (RURU ATAKKU)! This is the equivalent of Teraflu, but on steroids. The japanese recommended daily dosage is about the same as the weekly dosage of the US counterpart (Mayli managed to read the label and confirm the composition, and scale down the dosage to survivable levels). Well, this thing worked like magic: after the first pills most of my symptoms disappeared, and I was back in force, less grumpy (say, at normal level of grumpiness), ready for a new day of touristic japanese adventures. Now every time one of us (or some friend) goes to Japan, we make sure to bring back a bottle of ruru atakku, capable to defeat even the most terrible cold.